Volker Reinhold was born in Wernigerode in 1963. After training in music during 1971-83 in the city of his birth, he studied under Prof. Gerhard Bosse at the Felix Mendelssohn College of Music in Leipzig until 1989. 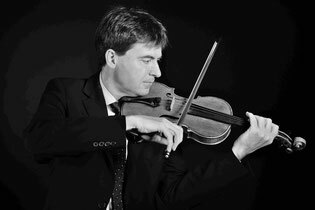 In 1989 Reinhold became the concertmaster of the Mecklenburg State Orchestra in Schwerin, where he has gone on to perform a wide range of solo assignments and to dedicate himself intensively to chamber music. Additionally, for some years he has often assisted as a concertmaster with several Northern German orchestras. He has a special predilection for the virtuosic violin literature, above all Fritz Kreisler and also Pablo de Sarasate. He has incorporated practically all of the former’s music into his repertoire. For many years he has performed successfully with his regular piano partner Ralph Zedler. Volker Reinhold performs on a »Mougeot, « a French violin from the nineteenth century.